Built 1959 for the city of Vancouver. 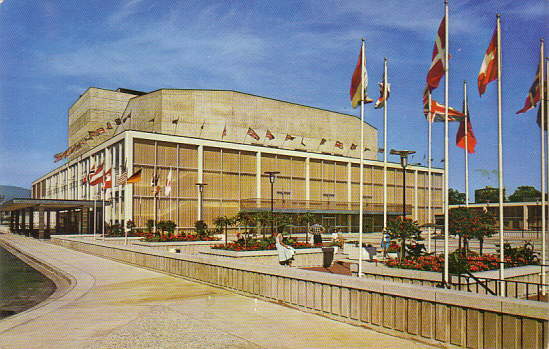 Opened 5 July 1959. Used for opera, musical, and ballet performances, as well as for classical and popular concerts. Home to Vancouver Opera and Ballet BC. 2929 seats. Reverse Text: "Queen Elizabeth Theatre, Vancouver, B. C. - Queen Elizabeth Theatre, which seats 2800 people and occupies an entire square block, was opened on July 5th, 1959. During the Queen's personal attendance on July 15th, 1959, she gave official sanction for the use of her name." 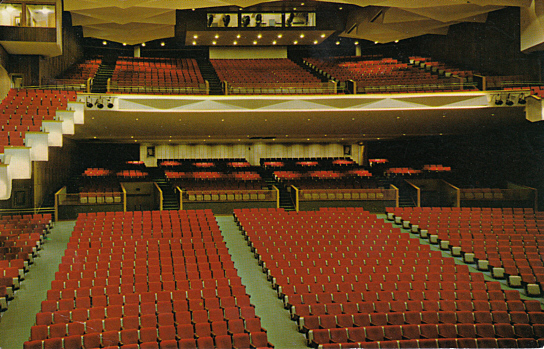 Reverse Text: "Vancouver, B. C., Canada - Queen Elizabeth Theatre - Inside View. The air-conditioned interior as viewed from the stage has 2,800 comfortable seats - designed for a variety of uses - concerts, daramas, musical revues, ballet, opera and available for conventions and meetings. Commodius and convenient."